Our service is tailored to meet the requirements of the busy professional. Before any client signs up , we assess their eligibility in order to ensure that we maintain a quality database for our existing members. All your personal information with be kept confidential. Dates are arranged in a discreet manner, with only your first names given. No contact details or photographs are exchanged. The initial appointment with Lunch Actually’s dating consultants is non-obligatory and free of charge. Clients only have to pay if they choose to become a member of Lunch Actually. We confirm a convenient date and time for you and your lunch partner. We cross-check your schedules, book the restaurant, and even call you up after the date to fine-tune your preferences and dating criteria. In a nutshell, we do all the work, leaving you free to have all the fun! We invite every interested individual to our office for a chat to verify each person’s identification, and also to sense out unsuitable individuals. Our matching system ‘SoulSeek’ comprises of a complete, well-rounded evaluation. We take into account psychological, physical and intellectual factors in order to ensure a high quality match between you and your date. Our members consist of doctors, lawyers, IT professionals, finance managers and even managing directors, with the majority of them in their late 20s and 30s. Rather than spending lunch with your colleagues, friends or even by yourself, you could use the same time to meet other single and like-minded professionals. If you don’t have time for lunch on weekdays, we also organise weekend lunches and early evening lunch style dates! Our emphasis is on making first dates short, sweet and simple. A: Meeting over lunch is the best way to discover whether you’re going to get on with someone. It’s relaxed, informal and you’re meeting on neutral ground. Going on lunch dates also has another advantage over going on dinner dates – it’s safe. You won’t be left wondering how to get through a whole evening with someone who makes you feel uncomfortable, and there won’t be any invitations for coffee, or awkward goodnights. An hour is also long enough for you to “explore” a person’s character in sufficient depth and decide if you wish to meet him/her for a second date. As we always say – short, sweet and simple. Q: Why should I use Lunch Actually? A: It’s the easiest, most convenient way to find someone with whom you’ll really connect. We understand that due to the fast working pace, many professionals do not have time to meet people outside their existing social circle. Through our comprehensive pre-screening processes, we weed out those whose interests and lifestyles are not compatible with yours. There is no rejection to deal with, and you can dictate the pace of the process. Q: What are the advantages of using Lunch Actually? A: One key advantage is that you can have the peace of mind that you’ll only be meeting legitimate singles. Singles on dating apps or dating websites often exaggerate or falsify details pertaining to their education, job title, and pay. Even your match’s profile picture presents a problem, as you have no way of knowing how old the picture is, or if it even is a picture of your match. However, At Lunch Actually, we interview every member, and also check their identification and other details in an extremely thorough process. Another key advantage – at Lunch Actually you have the opportunity to discuss your dates with a consultant and “fine tune” your dating criteria. The more people you meet at and the more feedback you give your consultant, the better we get to know you and the better we’ll be able to match you up with someone suitable for you. Q: How does Lunch Actually work? A: The Lunch Actually process is really simple! Call us or enquire through our website, and we will schedule a no-obligations appointment with you. Once you employ our service, we will comb our database for a suitable date. We coordinate and arrange your date. All you have to do is to turn up at the restaurant and enjoy your date! After the date, we will contact you to find out how the date went. Using your feedback, we will refine your dating criteria and start to find you your next date. Precise and personal matchmaking is one of the best features that dating services offer. It allows you to find singles who most closely match your criteria, while at the same time making sure that you also fit theirs. This will maximize your chances of hitting it off. Q: Will strangers get to see my personal information and photo? A: Lunch Actually does not show your picture to your potential date, and vice versa. When arranging for you to meet your date in a restaurant, your last name and telephone number are both kept confidential as well. After your date, it is both of your prerogatives to decide whether you wish to exchange last names and contact details. Q: What types of people join Lunch Actually? Are your members my sort of people? A: Our members are very much like you. They are busy, active and down-to-earth single professionals seeking long-term relationships. Many of our members would never use less discreet dating platforms, as they are in high-ranking positions at work, and they have a need for discretion and privacy. Our members include lawyers, health care professionals, and professionals in information technology, finance, sales, education and other working professionals. Q: What if I am too busy for lunch? A: You may also meet for an afternoon tea or after-work drink, or even for brunch on the weekend. Ultimately, we work according to your schedule, and you dictate the time of your dates! Q: How is Lunch Actually’s service different from just going on a blind date arranged by one of my friends? A: Our service is very different from the blind dates your friends arrange for you, because we hand pick your dates from the hundreds of singles in our membership base. Your well-intentioned friends, on the other hand, tend to introduce you to people who are simply single and available, with little to no thought about whether the two of you suit each other. Q: Do you take every person who contacts you as a client? I’ve heard you’re very selective – what does this mean? A: We are indeed a selective agency. Whilst our service is very popular, we do turn down prospective clients if we think that we are unable to meet their expectations in terms of the people whom they would like to meet. Q: What makes you such experts? A: Good question. The founder of Lunch Actually Violet Lim has been certified by the Matchmaking Institute in New York, an institute started by one of the most established modern-day matchmakers in US, Lisa Clampitt. All our consultants are trained in this proven system of matchmaking. We are also truly passionate about our work and have done extensive research and studies in order to create and refine our system. We are seeking to create the ultimate dating experience for our clients. Q: What if I don’t like a particular date? A: Though we are confident in the quality of our matches, if you don’t like a particular date, you can cut your date short, and follow it up by calling your consultant and giving specific, constructive feedback. The quality of your dates will also increase as you provide more feedback. Q: What do Lunch Actually consultants do? A: There is a substantial amount of behind the scenes work carried out by the consultants. This includes searching our database, going through profiles and talking with colleagues to find the right match. Each consultant’s selection is genuinely hand-picked based on our detailed knowledge of members. Another thing that our consultants do is to provide you with feedback. You may arrange for a progress review after five dates, during which our consultants will offer you an overview of your dates, and give you constructive feedback regarding your dating techniques. A: Yes, if you start dating someone, are going on vacation, or are just swamped at work, you can put your membership on hold at no additional cost. You can stay on hold for as little as one week to as long as six months per membership year. This can be done as frequently as you would like – just email one of our coordinators. Unlike other agencies, we do not promote a lower signing-on fee, whilst continuing to charge you for time when you are unable to use our service. We want you to make the most of your membership. Q: What do the dating services cost? A: The price of the membership depends on your profile, as well as your criteria of selection. We will match your criteria to our membership database to come up with a standard or customized package for you. Please contact us to find out more about the various standard packages available. Q: Why can’t your memberships cost less? A: It isn’t possible to offer the services of an introduction service that is genuinely both selective and personal cheaply. Advertising and staff are large costs. Specifically, we employ skilled and experienced consultants and allow them to invest considerable amounts of time in dealing with members on an individual basis. We also spend substantial amounts of advertising in the quality press and the internet to attract lots of new singles to replace those that have been successfully matched. Q: How do I join Lunch Actually? A: All you need to do is to fill up the information form, and we will contact you at a time convenient to you. Do include your phone number in the form – this is so that we may speak to you and schedule an initial consultation to give you a detailed evaluation of the type of people you will meet, how often you will meet them and the exact prices. A: Lunch Actually accepts payment through cash, NETS, cheque and all major credit cards. Q: How can I be sure of Lunch Actually’s service standards? A: Lunch Actually prides itself for its professional and highly personalized service. 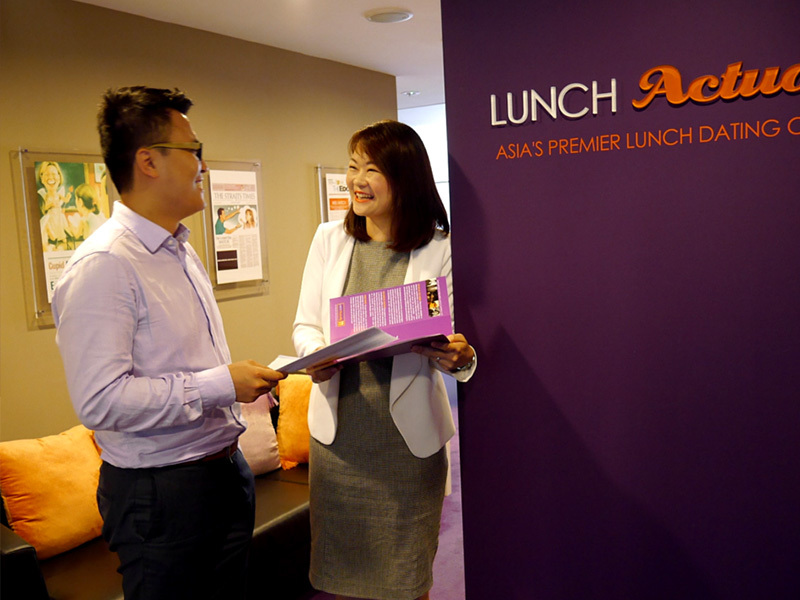 As a pioneer in the dating industry in Asia, Lunch Actually has invested heavily in its customer relationship management systems and training for our staff to deliver high quality service to the people we serve. To further assure clients of our business integrity and ability to deliver quality service, we are also a SDNTrust and CASETRUST accredited company.